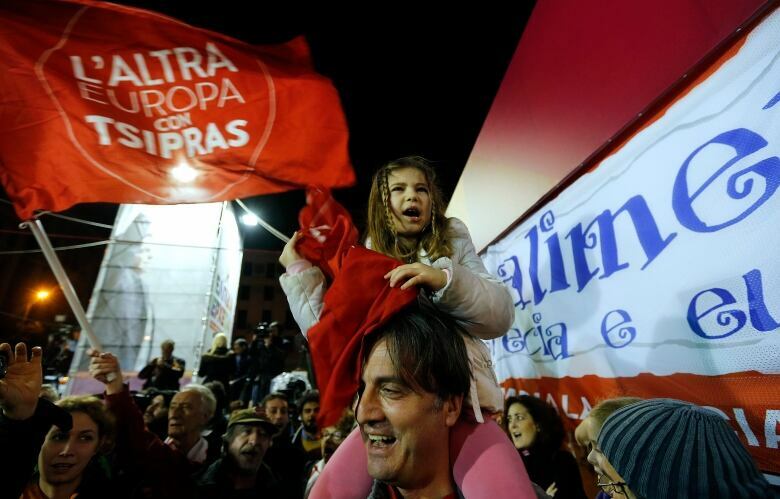 A radical left-wing party that is demanding an end to Greece's painful austerity measures won Sunday's parliamentary elections, threatening renewed turmoil in global markets and throwing the country's continued membership in the eurozone into question. But Syriza, which is led by 40-year-old Alexis Tsipras, was still waiting to find out whether it would have enough seats to govern alone, or be forced to seek support from another party, either in a coalition or as a minority government. Greeks might have to wait at least until Monday for all the ballots to be counted to find out whether they have a government. Whatever the case, all eyes will be on the opening of world financial markets after Syriza beat Prime Minister Antonis Samaras' incumbent conservatives. "What's clear is we have a historic victory that sends a message that does not only concern the Greek people, but all European peoples," Syriza party spokesman Panos Skourletis said on Mega television. "There is great relief among all Europeans. The only question is how big a victory it is." With 92 per cent of polling stations counted, Syriza had 36.3 per cent versus 27.8 percent for Prime Minister Antonis Samaras' conservatives. Samaras conceded defeat, saying he had received a country "on the brink of disaster" when he took over in 2012 and was close to ushering it out of the crisis. "I was asked to hold live coals in my hands and I did," he said. "Most gave us no prospect of lasting out and we did. We got the country out of deficits and recession ... and set the foundations for growth and a final exit from the crisis." Tsipras has promised to renegotiate the country's €240 billion international bailout deal, and seek forgiveness for most of Greece's massive debt load. He has pledged to reverse many of the reforms that creditors demanded — including cuts in pensions and the minimum wage, some privatizations and public sector firings — in exchange for keeping Greece financially afloat since 2010. The election result will be the focal point of Monday's meeting of eurozone finance ministers and Belgium's minister, Johan Van Overtveldt, said there was room for some, but not much, flexibility. "We can talk modalities, we can talk debt restructuring, but the cornerstone that Greece must respect the rules of monetary union — that must stay as it is," Van Overtveldt told VRT network. "As far as I am concerned, we can discuss the modalities (of the program) but it's impossible to fundamentally change things," he added. 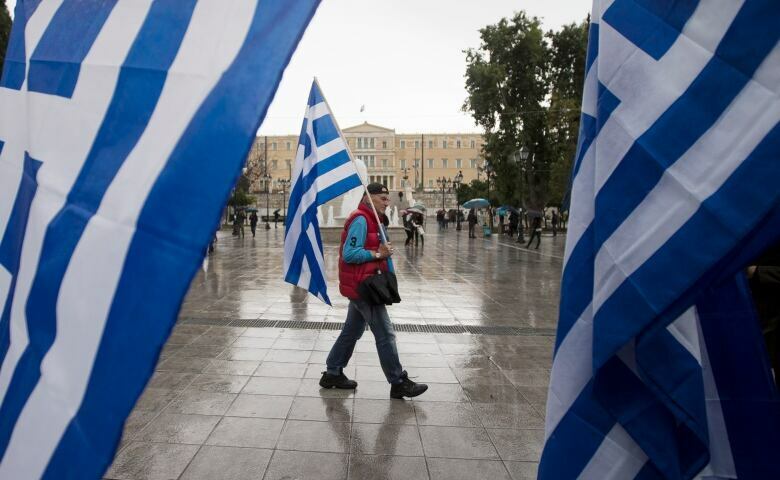 But Syriza struck a defiant tone Sunday night. "There is an expectation of economic relief for many, of a reboot of the economy and there will be a new debate on the servicing of the debt," Skourletis said. "Europeans have accommodated themselves with the idea." Skourletis said the election results heralded "a return of social dignity and social justice. A return to democracy. Because, beyond the wild austerity, democracy has suffered." Syriza's anti-bailout rhetoric appealed to many in a country that, in the past five years of its acute financial crisis, has seen a quarter of its economy wiped out, unemployment of above 25 per cent, and average income losses of at least 30 per cent. But it has also renewed doubts over Greece's ability to emerge from its financial crisis, and fears that the country's finances could once again send shockwaves through global markets and undermine the euro, the currency shared by 19 European countries. Hundreds of people turned out to celebrate outside Syriza's main electoral kiosk in central Athens, waving flags and cheering. The centrist Potami Party was battling for third place with the Nazi-inspired Golden Dawn, whose leader and several lawmakers campaigned from prison, where they are awaiting trial on charges of participating in a criminal organization. A Syriza government will see Tsipras becoming Greece's youngest prime minister in 150 years.